A good pasta sauce or roast is never complete without a selection of tasty herbs. The problem with purchasing herbs at the store… total sticker shock when your grocer wants to charge between $2 – $6 for the tiniest bottle. 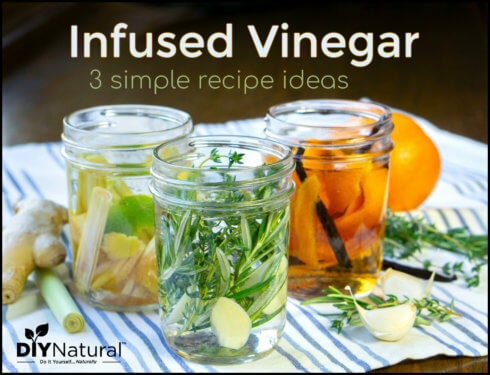 Growing and processing herbs at home is a simple and fun do-it-yourself project for the whole family. The first step is successfully growing a healthy plant. We have experimented with pots full of herbs on the patio, indoor potted herbs, and raised garden beds reserved specifically for herbs. 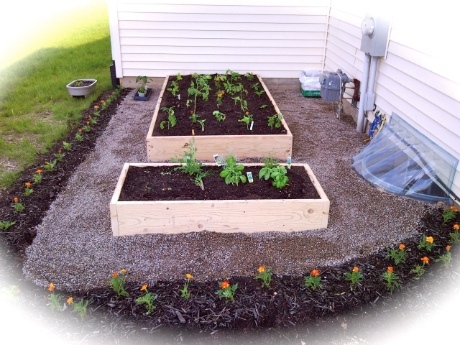 The winner… raised garden beds with rich black soil fertilized with our own vermicompost! My handy husband built a small (2′ X 4′) raised bed in which we have planted basil, thyme, cilantro, dill, sage, and rosemary over the past few years. Dill was my least favorite – it totally took over – and basil is definitely my fave (pesto, yum!). After your plants begin growing big and sturdy you can start harvesting. I snip my basil several times during the summer to promote new growth and to get the most out of it. Sometimes I forget about my poor thyme plant (a perennial!) and only harvest at the very end of the summer. Cilantro is so fragile and quick to go to seed that I normally only get to use it fresh. Each summer we use most of our dill to make homemade pickles, then I’ll typically get so irritated at the invasiveness of this plant that I rip it out to make room for the other herbs. I try to stay on top of my herbs each summer, periodically cutting to promote new growth, and drying it out to use until the next growing season. Preparing your herbs to be dried can be done in just a few minutes. Depending on my mood and the amount of time I have, I either shake dust/dirt off the herbs or rinse in cool water and pat dry very gently. The next step is gathering the herbs in small bundles and tying the ends together very tightly with yarn or string. 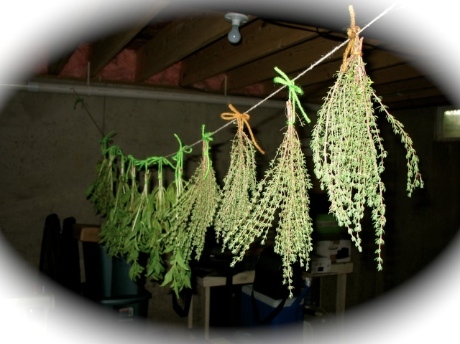 (As the herbs dry the stems will shrink, so tie tightly to prevent stalks from slipping out of the bundles.) Hang herb bundles upside down in a cool dark room in your house. 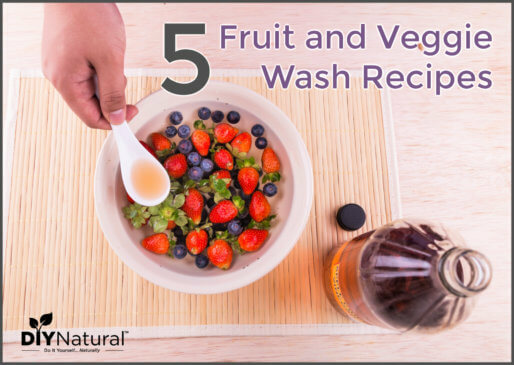 We have tied lines up in a dark basement or in a bright pantry, and both work well. Arrange bundles several inches apart so air can circulate more easily around each one. Herbs should be dried for about 2-4 weeks, then they’re ready to process. After taking herb bundles down from their hanging position, begin removing leaves/needles from stems. With most herbs you can hold the stem with one hand and run the fingers of your other hand in the opposite direction of growth to easily remove the usable part of the herb. Discard stems or save them for soup stock. Process herbs into small pieces using a food processor, crumbling with your hands, or just leave them large. We prefer minimal processing so the wonderful fragrance and flavor of the herbs is not released before we cook with them. We then simply crumble the desired amount into recipes during cooking. Store your herbs in sealed containers and label for future use. I store our herbs in small mason jars or clean, repurposed glass spice bottles. 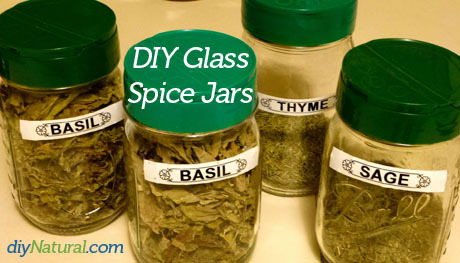 Shaker tops from old parmesan cheese containers make the perfect lid for your own dried herbs. Voila! Now you have dried herbs you can use in your kitchen, share with neighbors, or give away as gifts! 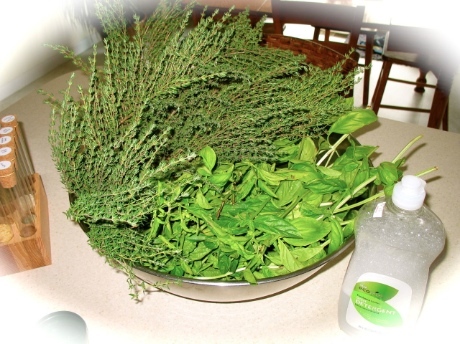 Do you grow and dry your own fresh herbs? If so, which favorites have you planted this year? to dry herbs quickly whilst keeping them green is to spread on a plate put in microwave for a few minutes check and microwave until dry and can be crumbled by hand and then store in clean jars!! Question, I know you are big dehydrator fans, do you ever use the dehydrator to dry your herbs or do you always dry them the way you’ve described in the article? We actually don’t have a dehydrator yet…still saving our money for the right one! And VERY envious of folks who already own one. 🙂 We would definitely recommend using a dehydrator for drying herbs if you have one! It would be more time efficient and take up less space. Thank you!! I don’t yet own one, but have easy access to one. I saw a episode on tv and they placed the herbs in brown paper bags with holes in it. The bags were stenciled with the name and using a holepuncher punch holes randomly over the bag. Tie your herbs tightly and place in the bag and tie the bag shut and hang. Very decorative and good for those of us without basements. I have also used brown bags however I did not punch holes in them. The bags help to keep dust off the herbs if leaving up until you use them or waiting until you are watching tv on a cold winter night to process them. Thanks for this timely article! I have recently harvested some mint and it was nice to read about what I am doing. I didn’t however consider leaving the dried herbs as whole as possible and leave the breaking up or crumbling until use. Great tip! Love your articles! Thank you so much! No problem Shelley! Glad you enjoy our content! I have had a wonderful herb garden for several years and have found that freezing the herbs in zipper bags works great. I wash and dry the herbs and either leave them whole or chop them. When I measure, I do it while they are still frozen as this most closely approximates the fresh herb. I use several varieties of thyme as a decorative planting. Because last winter was very mild in Ohio, my rosemary also over-wintered and is doing well this summer. Wonderful Harriet! This is a great alternative for people who might not have space to hang herbs, but have plenty of freezer space. Thanks for the thorough “how-to”. We plan to get a full herb garden going next spring.